I am extremely sad to write that brave, sweet Sioux lost her battle for life today. It's Saturday, February 4 and we got an urgent call this afternoon from Lori and Jim, Sioux's foster parents that Sioux had taken a major downturn. Within a few minutes, she was gone in their arms. She had such an incredible spirit and strong will to live that it is very hard to reconcile that she has died. Sioux came to us via Oakland Animal Services a few months go. She had made it through incredible neglect and given a second, third and more chances through TLC and medical rescue efforts sparing no expense. With each health challenge, she touched the precipice of death and seemed to come back with a renewed zest for life. Here is Sioux with her foster parents, Jim and Lori. They adored her and helped fill each day with love and care. Sioux had already survived a three-hour surgery several weeks ago. She also made it through a CT scan and ultrasound (to see if she had cancer, since she wasn't yet spayed) and travel to and from UC Davis. The doctor was so encouraged that Sioux had improved so much that she started planning for Sioux to have surgery as she gained some weight and was stronger. The CT scan revealed that at some point in her short life Sioux's jaw had been broken. Consequently, her teeth and jaws did not meet properly. She had a severe malocclusion that made it impossible for her to eat without having her teeth trimmed or being fed only soft foods. Before the doctor would operate on Sioux, he wanted her to gain weight. The ongoing infection and weight loss she suffered form her initial neglect including the broken jaw making it almost impossible for her to eat and untreated flea infestation had left her weak with few reserves to survive extensive surgery. It was recommended that Sioux be given a nasal feeding tube for a week or so to help her gain weight. Most bunnies don't really like this, and we were reluctant to do so, but it was her best chance. At first she did ok, but soon she stopped eating, since her belly was full with the nutritional supplement. Maybe her little body just finely wore out. According to her foster parents, Sioux's death was very sudden and very quick.She died in their arms. We all loved Sioux so much and were doing everything we could think of to help her live. Her vet bills are already very high for the work we have done so, far, but we were willing to try anything possible with a good prognosis, because Sioux was so special and really wanted to live. We are all heartbroken and devastated by her loss. I wanted to make sure to express my gratitude for the kindness and generosity we have received to help her. After my first special needs rescue, Camille, I was inspired to help the rabbits that nobody wants, or who require special care. These special rabbits are very expensive to help. Rabbits like these at shelters have very few options. They are usually euthanized without ever knowing love in their lives. Some people ask me if it is worth the expense of helping one rabbit with special needs when there are so many healthy ones that also need help. I try to not look at it as an "either /or"., but rather, how can I help both. 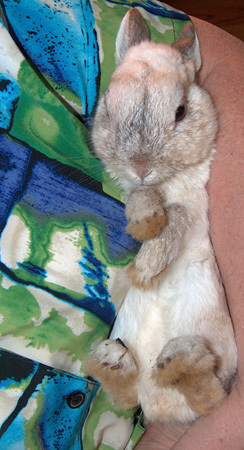 So, I do everything in my power to raise funds and awareness to help each rabbit. When I connect with these special little souls who are so grateful and give so much back, the choice is always clear to me. That is where support from people like you allows our group to take the risk to help these animals. With your donations, volunteer help, compassion, encouragement and support, we always aim for miracles. We often get them. Sioux's time with us was way too short, but it was filled with love from many people. We are deeply grateful to Dr. Carolynn Harvey at VCA animal hospital, Lori and Jim, Jodi and all of you who tried your best to save her. Sioux was buried today in our yard across the creek and under the trees, near Snickers the cat and Bob the bunny. Sioux touched us all. We will miss seeing her cute little face in the years to come. Sioux has had a very up and down week and is now at UC Davis Hospital. A few days ago she had stopped eating and it really looked like we were going to lose her. Normally, she eats very enthusiastically---unlimited Critical Care from a bowl. We couldn't get her to eat anything, not even a piece of banana. We changed her pain medicine, gave her fluids (which we do anyway every day) and did our best energy healing work, along with getting vet advice. There wasn't much to do, other than hope for a miracle. Sioux started eating again and we put her in a large exercise area, because she loves to be the center of attention and be with people. She perked up and started eating,grooming herself and exploring. Sioux was extremely thin when we first took her in about two months ago. One of the biggest questions we are dealing with is why she is still so thin. Is it the toll of the abscess? Is it from so much neglect for so long? Is there a bigger heath issue we haven't diagnosed, like cancer? We don't even know how old she is. She looks terrible, but that can mask a bunny's true age. Yesterday, 1/27, Sioux taken to the UC Davis Small Animal Clinic for more tests and will stay over the weekend. We will repeat blood work that was done about a month ago at VCA with Dr. Harvey. If Sioux continues to eat and maintain her strength, she will have a CT scan on Monday to determine if the abscess and infection can be surgically treated. She will also likely require all her teeth--front and back to be pulled, because they are rotten. We know this is an awful lot for a little bunny to endure. Just to clear, we feel strongly about not forcing medical procedures on a bunny, but it is very clear that Sioux REALLY wants to live, so we are trying. I am extremely grateful for the emails and donation we have received. I hand write our "Thank You" letters, and you will receive one soon. I am working on several major rescues, some not yet listed, and also still with Phoenix. Consequently, am behind in my correspondence. But , please know, your help is vital to the work we do and we greatly appreciate and need your help! We are totally volunteer -run and funded only by donations. The priority is always the rabbits, so sometimes, it takes me longer than I would like to write back. However, please know that your emails are read right away and your help and support is extremely valuable and saves many lives. My name is Sioux. I am a small, sweet, dwarf girl rabbit who is currently quite ill with jaw abscesses. I have a very strong will to live and am very loving and snuggly, but I really need major surgery and your help. I have already fought back from near death. I was infested with fleas when I first came into the Oakland shelter. I had a bad malocclusion and was unable to eat. I was extremely thin. I had been kept on a wire cage and my feet were flat,raw and bare in spots. It's obvious that I was very neglected. SaveABunny took me in and I had one surgery to try to clear out the abscesses. But because I am such a tiny rabbit---less than two pounds, the hospital did not have the very expensive special equipment needed to do such dramatic surgery. So they did the best hey could, but it was not enough. I had an appointment this past week with a veterinary surgical specialist who does have the special equipment. He says that I really need a CT scan, x-rays and surgery. The estimate he gave would cost about $4,000. Unfortunately, he does not offer a rescue discount, so it will be at least that full amount. My chances of success were estimated at about 80%. If you think about it logically, all that money could really be used to help a lot of other bunnies. But please think about me----I really love people and want to live. I am still very thin and fragile, but the hope is that I can become strong enough to have jaw surgery to clean the abscessed areas and have amitotic beads implanted. This is really my only hope for survival. Some people have asked if it would be better to just euthanize me, and I can tell you with confidence, that I still have a strong will to live and appreciate every chance I have to heal. It is nice to finally feel love and warmth. Please keep me in your thoughts and wish for me a long, happy and healthy life.